These 1997 Bowman's Best Mirror Image Atomic Refractor's really nice looking in hand. The Atomic Refractor has been somewhat overshadowed by the Xfractor and the eminent Superfractor. They sparkle when moved about under the light which gives a really nice rainbow effect, it’s quite appealing. 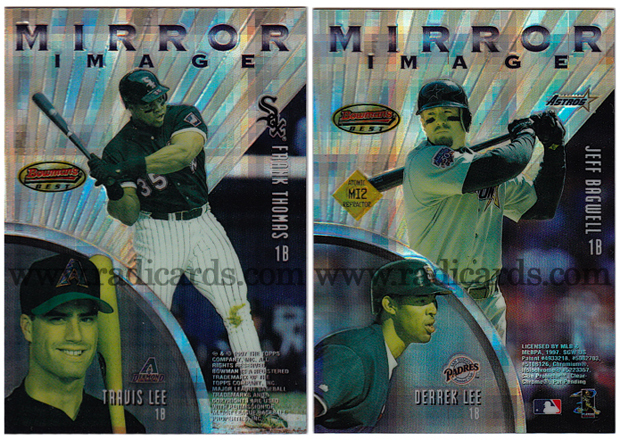 Bowman’s Best did the Mirror Image insert set in 1996 and 1997, however, 1997 was the only year they made an inverted parallel. If you look at the card, you will see Thomas and Bagwell depicted in the majority of the cards real estate while T.Lee and C.Lee are depicted in sub photo’s to the bottom left of the card. On the inverted parallel, these photo’s are switched. Thomas and Bagwell on the smaller photo’s and T.Lee and C.Lee on the main photo’s on the card. The picture you see above is the non-inverted variation. Although more common, it’s significant in that it’s the Atomic Refractor parallel. These 1997 Bowman's Best Mirror Image Atomic Refractor's were seeded at a rate of 1:192 packs. Judging by the current going rate for this product, let’s assume an SRP of $1.99/pack. In order to pull any one of these Mirror Image Atomic’s, you would have to buy 192 packs (8 boxes) of this product which would set you back roughly $382! Here’s where it starts to get interesting. There are 10 cards in the set, that means that in order to pull this particular card, you would have to open 1,920 packs (80 boxes) which will cost you roughly $3,820! Just a little food for thought when you locate one of these guys at your local hobby shop or on the bay. Bowman’s Best is beautiful. 1999 and 2000 are my favorite years for this product. I know I have some sweet inserts and rookie cards hiding in my collection. I’ll have to dig them up and share! Patrick – what does that bronze diamond say on the Bagwell/Lee card?